When I work with Manifold I always import and export files from the local project folder (the folder where the M8 project is saved). Is there a variable like %Manifold%\... I could put in the Options dialog for 'Import and Export' that would make the default folder in the File dialog the local folder? It would save me heaps of time and clicking! Go to Tools > Options > File Locations and set the Import and Export entry to either an empty string or a single dot. You can do the same with the Projects entry if you like. Then relaunch. After the first time, the dialogs will then remember the last used folder. I think it is partly in the manual. Wouldn't that be the last used folder, so the dot will work? You can also use Quick Access, since the Import dialog in 8 provides that dialog at left. Having the dot in the Tools > Options > File Locations> Import and Export entry causes the import and export dialogs to initially open in Windows/System32 - a long way from where I would like it be. Sure, following changing that to the folder of interest it will continue to open there for the remaining session in that project. Close that Manifold project and open the same or another and you are back to Windows/System32 as a dialog starting point again. I understand that this may seem petty but it is usual for me to open and import/export from 2 to 5 or occasionally more projects on any given work day. Thanks for the tip on Quick Access. 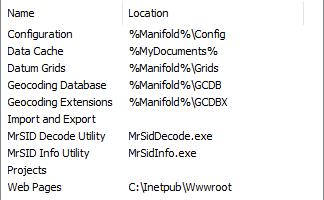 It is a busy looking window however and takes a second or two to find my folder in it (many of my Manifold project subfolders have the same name ("GIS") so I need to look at the paths below the icons). What I was looking for was similar to what happens when you open the File>Save As dialog - its default is the current project folder rather than Windows/System32. Perhaps then it could remember the last folder choice for the remaining session. No problem. I will write a script to automate the process. I just wanted to be sure I wasn't missing anything too simple first. “Initially”? That is normal. You need to use a folder for it to be remembered. If you still have a problem, try empty string instead of dot. Many years, no problem. The manual could be wrong about the dot. Actually I think they mean different things. The dot means this user’s current folder, for any application. The empty string means the folder stored in the registry for the current user, for Manifold. Keep the location '.' (the dot = current folder) and change the starting folder on the shortcut you use to launch Manifold. Modern Windows versions made this more difficult to do, but it is still there (in Windows 10 you have to open the Start menu, locate the shortcut, right click it, invoke More - Open file location, this will get you to the shortcut, you have to then right click the shortcut and invoke Properties, then you can change the starting folder in Start in). I don't think so. Here is what mine looks like. Honest. As mine is setup, it always goes to the location of the last opened project. Say you open a project, then use Import... What folder is presented by default? It goes to the folder from which I last imported a component from. It also does this if I close the session and open a new instance of Manifold. Have I misunderstood what Steve was asking? I think you understood perfectly Dan. My guess is that in recent versions of Windows/Visual Studio, %MyDocuments% refers to no known folder. So that (outdated) entry is effectively the same as an empty string. The location described by %MyDocuments% still exists and %MyDocuments% still resolves correctly to it. I would like it to work like the 'Save As' dialog - export/import dialogs open to the folder where the MF project is saved only. Eg: a project called 'Melb1094.map saved at C:\Data\Melb' will always have its export/import dialogs open at C:\Data\Melb & a project called 'Syd01123.map saved at 'C:\Data\Syd' will always have its dialogs open at C:\Data\Syd. I suppose an unsaved project could default to the Documents folder or somewhere else (not too important to me). Its not helpful for me having the Melb1094.map open its export dialog at C:\Data\Syd or vice-versa (just as goose juice is no use to a moose - if you know your Dr Suess). It's a project dependent thing rather than application wide if you get my drift. Happy to knock out a script! That might be good for you (at least sometimes), but it would not be good for me or, I think, for the general case. You may be in the habit of storing all your source and export data in the same folder as each project; but how common is that? And is it good practice? With loads of data (in and/or out) it quickly becomes impractical. I think it is more common (and also more workable) to keep projects separately from source data and export data. It is good (or at worst not bad) that the dialogs default to, and remember, different folders. I think the closest to this is to use '.' (current folder) for both 'Projects' and 'Import and Export' file locations. "That might be good for you (at least sometimes), but it would not be good for me or, I think, for the general case." Luckily I'm not asking for it to be hard coded into MF8! I just wanted to know if it could be done as an Option. As a matter of interest I do use separate folders for data input & output within a folder hierachy - I just simplified my example for clarity. My folder organisation works very well for me thanks. Thanks Adam. What you say reinforces my resolve to create a custom Add-in! That way I can do what I have described for most work & use the standard workflow when I think it would work better. Thanks all for the input everyone.